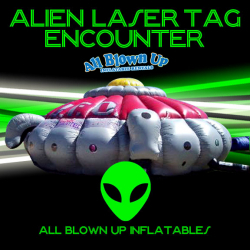 You and your guests will enjoy hours of fun when you enter the inflatable laser tag space maze! After being outfitted with the laser sensor system and laser blaster, you can hunt aliens all day! The sounds of the laser blasts and laser sensors will be heard throughout the game. Intelligent scoring packs calculate the score for each player. Up to 6 players can play at once.